Vada's Blog Stamp Inks and Paper : GC. #71 Random Redhead Challenge is “Inches”. Do you like something small? Well Inches is the challenge for you. Just 1” x 1” is all you need. For my card I went with small garden tools and flowerpot and a pumpkin from TAC. Colored them with Copic’s. My background paper is typing paper, which I embossed. The punch is from Martha Steward. Thanks for stopping in. Let’s see your inches..
Love all your wonderful details! 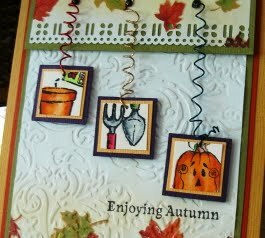 The embossed background is just perfect with the "hanging" inchies! Love this!!! Great work. I'll have to try my hand at these. Thanks for the inspiration, this is wonderful, love the Autumn Colors, they are my favorite. Just darling Vada and perfect for the season! 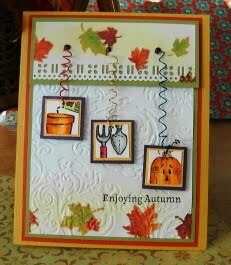 Lovely card Vada, fall is my favorite time for colors and this card just fits. Beautiful details. I haven't ried inchies, but must give it a go sometime, thanks for the inspiration! Darling! What a great way to use inchies.. As always, I love your work. Thanks for sharing.